Men’s hockey coach, Greg Puhalski (Contributed photo). The department of athletics and recreation at Wilfrid Laurier University signed the contract extensions of men’s basketball coach Peter Campbell and men’s hockey coach Greg Puhalski for an additional five years Tuesday afternoon. 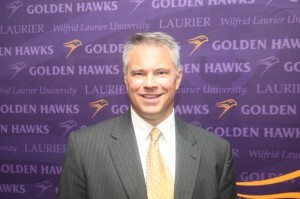 Puhalski, currently in his fourth season at WLU, led Laurier to the playoffs in his first three seasons. He was named the Ontario University Athletics (OUA) West division Coach of the Year after the Hawks went 9-3-0 in the second half of the season. His award was the first for a men’s hockey coach since the 1998-99 season. Laurier’s men’s hockey team is currently 7-11-1 this season. 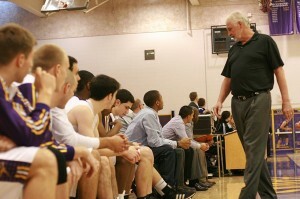 Campbell is currently in his 14th season with Laurier’s men’s basketball program. Laurier qualified for the playoffs in every season with Campbell except for one, and Campbell has won the OUA West Coach of the Year award. In 2005-06, Campbell helped guide WLU to the Canadian Interuniversity Sport (CIS) championships where they finished 9th in the country. Campbell’s team is currently 7-8 this season. According to the release, the contract extension guarantees that Campbell will finish his tenure as a coach in the OUA with Laurier. Both coaches have signed on with Laurier through the 2018-19 season.